As all travellers know, one of the cheapest places to get a good feed is at the good ol’ supermarket, and in Australia it is the same. Going so far as to say that this is cheaper than McDonalds and potentially twice the portion, make sure that you don’t walk past this not-so-secret place if you are in need of some cheap, although greasy, food. Our two main supermarkets are Coles and Woolworths and both offer similar products; my lunch here is from Coles as they are just that little bit closer to where I work. 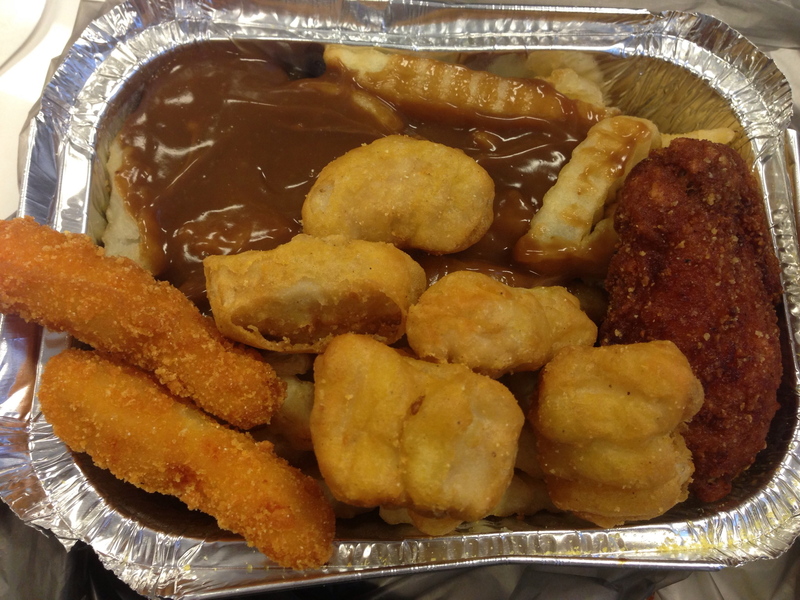 Wanting to go all out and try a bit of everything so that I can report back to my valuable readers, I decided on the hot chips with gravy (which I don’t usually get), a hot and spicy wing, some chicken pieces and chicken nuggets. Let’s start with the chips and gravy. The serving is definitely generous and the chips are rather delicious: not too oily because they are thick and crinkled and the gravy adds the extra flavour to the meal without being too overpowering or, well, gross. Now the chicken. I usually don’t get chicken wings as I find the whole process of bone picking too complicated but this one was rather good and there was more meat in it than fat or skin. Probably not what I would call hot and spicy, but this wing got the job done in terms crispiness and overall meat to ‘other’ ratio. The chicken pieces were not too bad, perhaps a little plain if anything, however the chicken nuggets were delicious! They tasted rather similar to the ones from McDonalds and most definitely enhanced my greasy eating experience. This meal (in terms of quantity) would probably have been enough for two, although next time I would only get the chips and nuggets. So if you were to share the chips and get 6 nuggets each, that would be a meal for a massive $2.50 each…. yep, definitely cheaper than Maccas! Click here to see full photo gallery on Facebook. This entry was posted in Sydney and tagged Alisa Nemirovska, Australia, Backpacker, Cheap Meal, Chicken, chicken nuggets, chicken wings, Coles, Cricket’s Aunty, Gravy, Hot Chips, McDonald's, Nuggets, Solo, Spicy Wings, supermarket chain, Travel, Travel Blogger, Woolworths on January 16, 2013 by Cricket's Aunty.